Phares Wabo (55) makes his kicking debut against Alabama A&M. 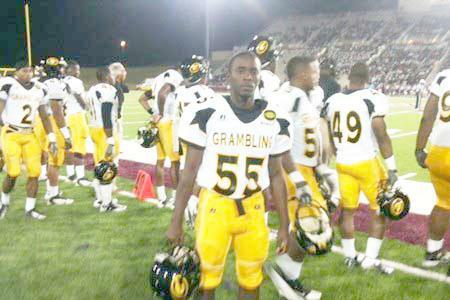 He scored one field goal and two extra point conversions, for five points, in Grambling fourth straight loss, 38-17. Grambling State University's winless football team announced open tryouts for a place kicker, so the school's intramural club soccer team coach encouraged his players to take the rare opportunity to join a Division I team in the middle of the season. About six students took them up on the offer. In the end, Phares Wabo, a native of Cameroon, won the job - only three days before Saturday's football game against Alabama A&M. "Lucky for me, I made the team," said Wabo, 21, a junior accounting major. "And I've been working hard, since that day, to be a better kicker." Wabo has continued to work hard this week as he and his new teammates prepare for the State Fair Classic, an annual game against a Prairie View A&M, a team gunning to move the Tigers' record to 0-5. In spring of 2010, Wabo left his small African nation because his older brother, Blaise Wabo, a graduate accounting major at Grambling, encouraged Wabo to join him in America. He made sure his two brothers were the first to know. "They were really, really happy for me," said Wabo. He and his brothers played "fÃºtbol" growing up in Africa, what most Americans call soccer. Wabo grew up wanting to be a professional soccer player and travel across the globe. "I definitely have a better understanding of (football) now," Wabo said. His parents, Andree and Rosaline Wabo, did not grasp his achievement, as Wabo expected. As they watched him play online on ESPN-U, they began to understand the magnitude of his opportunity, playing at a legendary football program and for Doug Williams, an internationally known former NFL football star. Wabo made an immediate contribution, making one field goal and two extra-point conversions, in Grambling State's 37-17 loss to Alabama A&M Saturday. It was the third SWAC loss. "But at the end of the day, it's about the team," Wabo said. "And we lost." Williams didn't like losing, but he gave Wabo credit for making the team competitive. "You talk about a kid, his first time out, give us five points. That's pretty good," said Williams. He described Wabo as "the happiest guy in Huntsville" after the Alabama A&M game. Wabo attributes most of his quick adjusting to Grambling's senior punter and former kicker, Fabian Carter. "I am glad I have the talent and opportunity to help someone," said the Miami native, "and he is getting better." Having the double load of kicking assignments until recently, Carter spends time teaching Wabo the fundamentals of kicking a football compared to kicking a soccer ball. "I have been working with (Carter) since Day One," said Wabo. "What I am able to do right now is because of him." Walking into his first day of practice, Wabo felt an uneasy tension as other players watched him closely, still not confident of his abilities. More than anything, he wants to be considered a part of the team and be ready to contribute. "Once you put that 'G' on the side of your helmet and the 'G' across your chest, you are an official G-Man," said Carter. Wabo is determined to be a good football kicker. He was unable to fulfill his dream to be a professional soccer player, so he looks at this new opportunity as another chance to travel and compete. "It's like my dream is coming true but in a different sport," said Wabo.